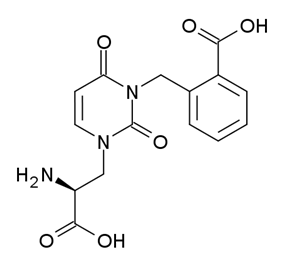 UBP-302 is a highly selective kainate receptor antagonist used in the study of many neurological processes. It is active at micromolar concentration within an in vitro preparation and specifically targets the GluR5 subunit of the receptor. This compound was developed at the University of Bristol. ^ More, JC; Nistico, R; Dolman, NP; Clarke, VR; Alt, AJ; Ogden, AM; Buelens, FP; Troop, HM; et al. (2004). "Characterisation of UBP296: a novel, potent and selective kainate receptor antagonist". Neuropharmacology 47 (1): 46–64.